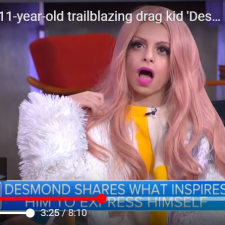 (Michael Foust – Christian Headlines) ABC’s Good Morning America celebrated an 11-year-old drag queen as a trailblazer this month, although many viewers pushed back and said the show had crossed the line in sexualizing children. Moments later, after the video, the boy strutted down a runway toward the Good Morning America set, wearing a blonde wig and a yellow and white dress. In the video, Napoles said his mom doesn’t let him drink caffeine but that she is proud of his drag queen sidelife. Napoles performs throughout New York City as a drag queen. He wore women’s clothes and marched at a gay pride event at age 8.